Low vision can happen from birth or early childhood but it's more common in older people. You can lose sight through an accident, cancer or brain injury. But the most common causes of loss of vision are age-related macular degeneration, diabetic retinopathy, glaucoma and cataracts. With low vision, you might have trouble picking out and matching the colour of your clothes. The lights may seem dimmer than they used to, making work or household chores more difficult. Low vision might affect your ability to see things clearly (this is called visual acuity), to see the differences between colours, and how far or wide you can see (this is called your range of vision, or visual field). You might find that one or several of the following aspects of your vision are worse. Central vision: This is the detailed vision you use when you look directly at something. Macular degeneration (AMD) affects central vision. Diabetic retinopathy can affect central or peripheral vision. Peripheral vision: This is the less detailed vision we use to see everything around the edges. Glaucoma affects peripheral vision first. Strokes can affect one side of your peripheral vision and not the other. Contrast sensitivity: This is the ability to distinguish between things that are similar tones, like milk in a white cup, or to see facial features. All eye problems can decrease contrast sensitivity. Depth perception: This is the ability to judge where things are. New vision loss in one eye can affect your depth perception – for example, you might have difficulty judging the height of a step. Visual processing: The lenses in our eyes focus light rays on to our retinas. The retinas turn these light rays into signals that travel through our optic nerves to our brain. Our brain then interprets the signals and turns them into the images we see. A problem at any part of this process will affect our vision. The most common types of low vision include loss of central vision, loss of peripheral vision, night blindness, blurred vision and hazy vision. 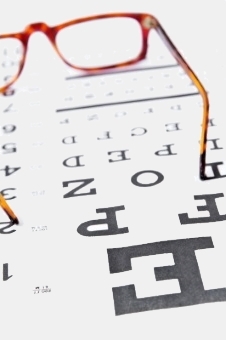 It's important to have regular eye examinations so any eye problems you develop are diagnosed early. This means the problem can be treated as soon as possible.